My new booklet on the Lublin region! As I write this I am about half way through proofing a new project – a booklet about this region of Poland based on about a dozen of my images and the kind of things that interest me about the region and which actually led to me creating the images. I want to produce an alternative to the rather boringly similar other guides I have seen, and I have seen many, something that talks about stuff one does not need some qualification in the history or architecture to appreciate. Basically, I tie together a series of reminiscences to form a kind of story, introducing a little bit of many things to make the region more understandable, to have a bit more depth. The Wisła River, or Vistula as we know it, forms the western border of the Lublin province, and has a number of bridges and ferries operating along its length. Rivers have always been some of the most awkward things to pass when we wish to travel on land as they are not something that we can simply go round. 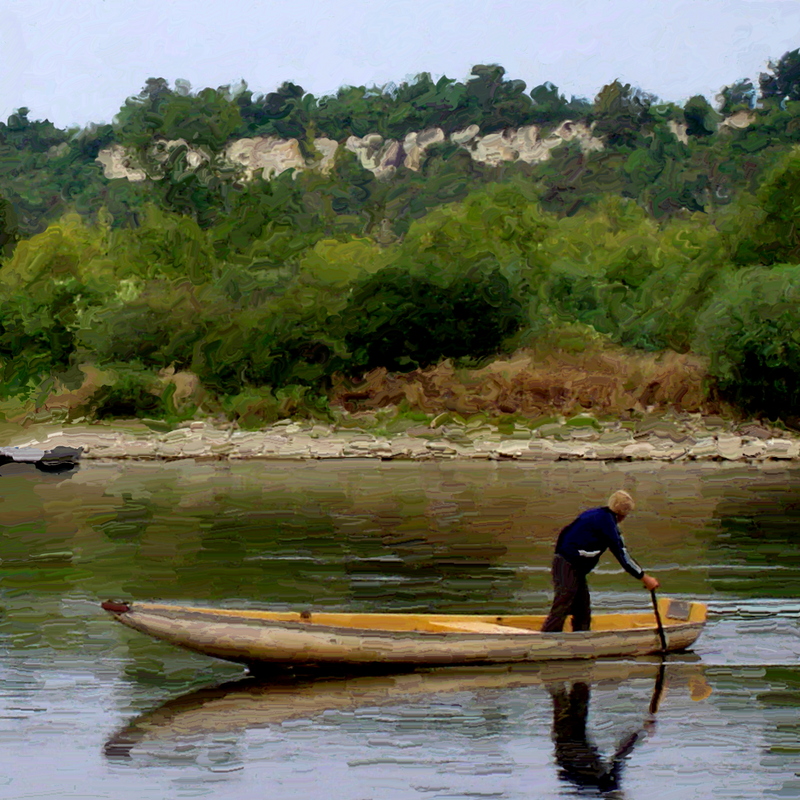 The particular ferry route we chose is quite ancient, lying as it does on the trade route between Krakow and Lublin, at the popular small town of Kazimierz Dolny. On this occasion we had intended on using the car ferry, but were thwarted by water too shallow for anything but a passenger boat to traverse. While this latter style of boat is today made of glass fiber, its general design is pretty much the same as the wooden boats that have long been used on local lakes and rivers. I plan to publish it as an ebook, so it is available anywhere for very little money. I am sure I shall make some mistakes along the way, but it feels good to be doing something a little different. When I came to live in Poland in the mid-1990s, there were still a significant number of farms relying on horses for wagon and ploughing duties. Today few remain, and since horse riding is quite a minority activity in comparison to other European countries, the actual number of horses has declined. However, the village museum in Lublin has a small stock of working horses, and on one visit I was lucky enough to view a re-enactment of an uprising event. I have no idea whether the equipment used was accurate to the period, but it was a fun event nonetheless. Have you ever seen those pictures of racing cars with the car in perfect focus and the background nicely blurred. well, that is the effect I wished to achieve. 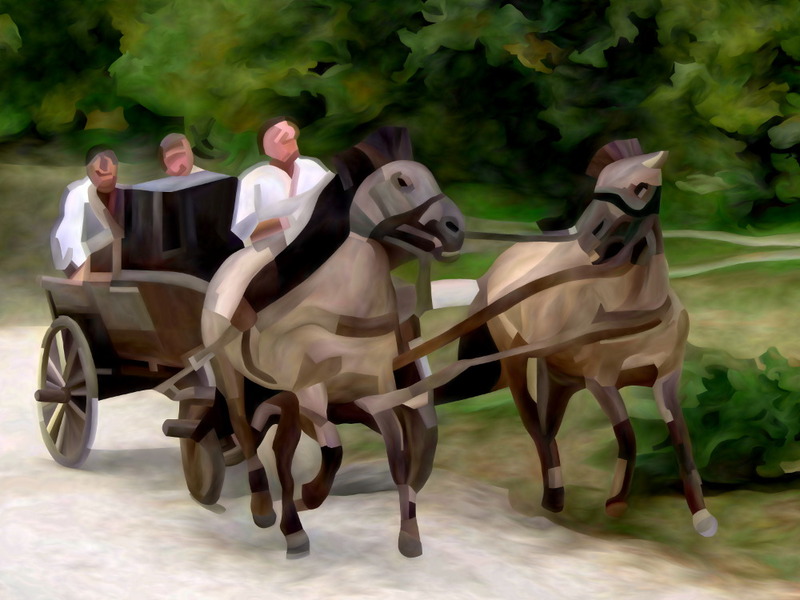 You can see that the horses have hard, sharp edges, which is easy enough although time consuming to achieve, but you can get the blurred background by using a larger and then a smaller brush, using the larger to first define the color patches, then the smaller brush to blur the edges and get rid of any actual lines. 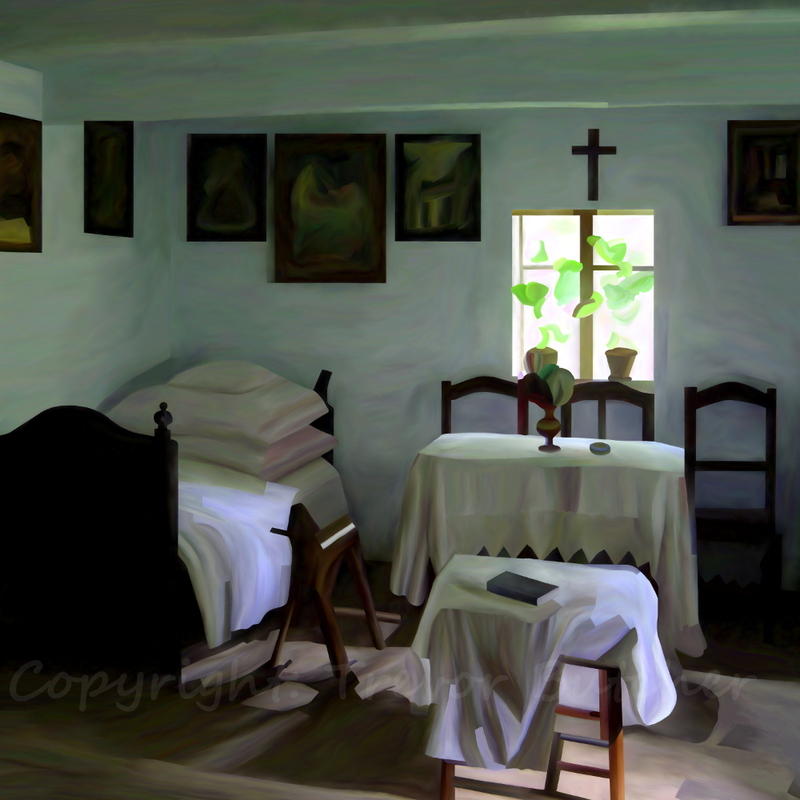 Polish Cottage Interior. My abstract view of an inside view of what it used to be like living in a cottage, and commentary on the future for such buildings. When one drives around the rural areas of Poland it is still common to see old wooden cottages, although there number is decreasing as they are replaced by homes made of cheaper materials, such as concrete blocks. The two issues of most significance are that wooden cottages are expensive to maintain, and most are still owned by people who, in some form or other, have work related to agriculture. In a way it is sad to say, but the future of cottages is often highly dependent on being bought by people with urban work, who can afford to pay the costs of living in rural housing. This drives up the costs of buying homes in the countryside and in villages, making agricultural work more difficult to achieve as a profession. Since wooden cottages of the types found in Poland can be readily dismantled, it is not uncommon for them to be sold as a kit, ready for you to reassemble on your own land. Sadly, though, many are just allowed to decay until the only solution is demolition, although some are being clad in thermal blocks to continue their life emulating a more modern home. This is one of my favorite places in Lublin, where we often go to buy our fresh fruit and vegetables. We used to go more often, but first Ania’s job moved away from the area, then we found a new flat less convenient for shopping there – and yet it still retains its charm for us. These days we have to drive their, so we normally pop in if we happen top be driving past. Most of the people who shop there tend to be older rather than younger, and more likely to walk there from their apartments nearby. The stallholder used to be mainly farmers, but there has been a shift more to market people buying goods from farms, or farmers mixing homegrown and bought produce. There are also some other shops there. When I first started going in the mid-1990s these were a standard mix of planned Socialist era shops, such as the plastics goods shop, the metal goods shop, fish shop and the like. Since then some of these have died (like the plastic goods shop) due to the other shops diversifying into their areas. The original idea for the market when it was created in the late 1960s was to be a small mall of shops with broad ways between them and a small market stall area. 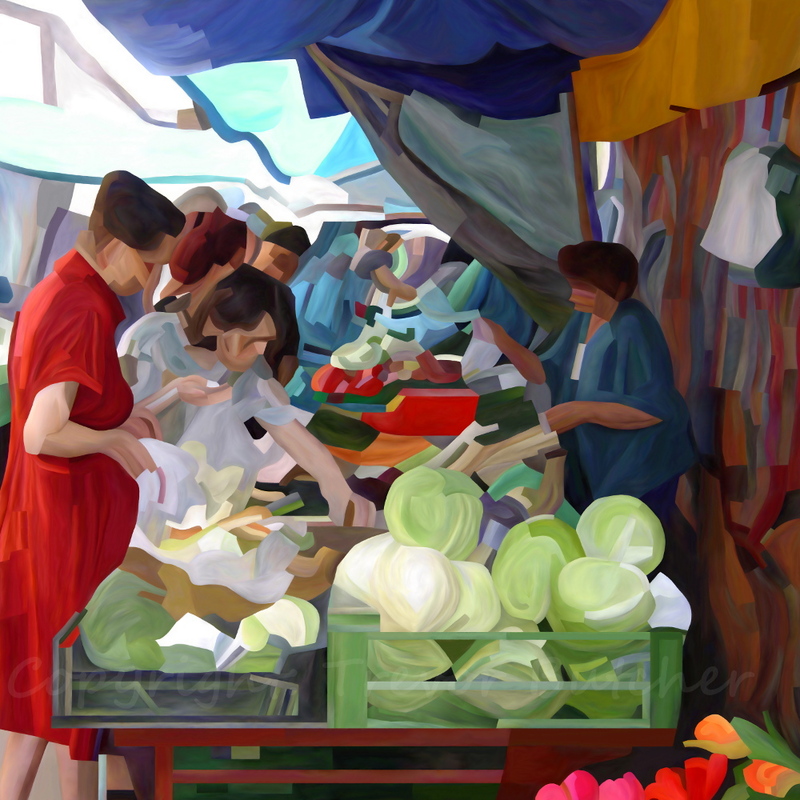 Instead, the passages have become choked with stalls selling produce on either side, the shops role is secondary, and the proper stall area has become an area for cheap handbags and clothes. In the small gaps and corners between the stalls you still see some very old ladies who bring in something like a small bag of peas, some eggs, or a plucked chicken to sell to eke out their pension. On a rainy day there may be few stalls, on a warm sunny day you might struggle to get through the crowds. We love it! One of the things I love about the countryside in late summer is watching the crops being brought in. I can still feel the same excitement I did when I was 5 years old and the seemingly huge, red combine cut the corn in the field behind our house, or discharged the crop into blue trailers being towed alongside the combine by tractors.